The Evangelical Lutheran St. John's Congregation was organized on October 20, 1889, under the leadership of Rev. C. Kreuzenstein. Three attempts were made to organize that year. 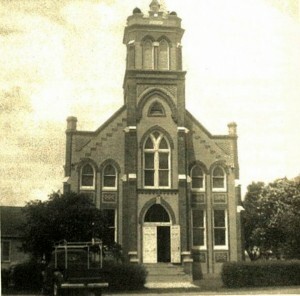 The first service of the new congregation was held on April 2, 1889, in the schoolhouse of Marion. A second attempt was the adoption of a constitution on May 20, 1889 known as the Constitution of the “German Evangelical Lutheran Church of Marion Texas.” Finally, on October 20, 1889 another service was held in which 26 families bound themselves together to form St. John’s Congregation. It was at this meeting the congregation decided to build a church. As first pastor of this congregation, the Rev. C.
Kreuzenstein served us from St. Paul’s Evangelical Lutheran Church in Cibolo, TX (which is now St. Paul’s United Church of Christ), after serving as pastor of Emanuel’s Lutheran Church in Seguin, TX. 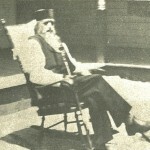 He served as pastor of St. John until July 31, 1892. On November 23, 1890, the first church building was dedicated after much collecting of funds and donated labor. It was dedicated under the name “Evangelical Lutheran St. John’s Church.” Approximately $1,306 ($600 borrowed) was gathered to pay for the building and furnishings. The church bell was purchased at a cost of $106.35, the foundation stones for $57.60, and the lot for the church building, at the southwest corner of Highway 78 and Cunningham Street, for $120. As far as can be determined, the old church bell is one of the two bells still being used in the present structure. The total cost of building the church and its furnishings amounted to $1,882.35, and was paid in full on January 1, 1898. Several “firsts” in the history of the church occurred within two years of establishment. In the spring of 1891, a cemetery committee purchased two acres of land near the intersection of Wetz and LaVernia streets from the railroad company. The clearing and fencing were done by donated labor of members. Cemetery rules were set; many of which are still in force today. After requesting release from this congregation on July 31, 1892, Pastor Kreuzenstein accepted a call to serve an Evangelical United Church. Having accepted his release, the congregation then extended a call to the Rev. F. Grueber of Christ Lutheran Church, Elm Creek, near Seguin, TX. 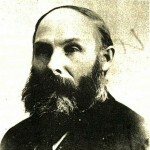 Pastor Grueber served part-time until October 1900. His call meant a difficult task because of strife with a former sister congregation in Cibolo. A meeting was held and the majority of members voted to remain “Evangelical Lutheran,” as they had been organized, and as stated in their original constitution. A constitution of this order, however, was adopted in August 1893 by the semi-annual meeting. In 1893, the terms of church council members were set at two years, with three council members’ terms thus expiring each year. In 1900, Pastor Grueber accepted a call to Cartlett, TX. On November 4, 1900, the Rev. Henry Schmidt of Brownwood, Texas became pastor of our congregation. The congregation prospered under his guidance. In 1901, a parsonage and parochial school were built, as well as a barn consisting of a buggy shed and wash house. This school continued in existence for a few years. Summer sessions continued for 20 years. The building was used for a Sunday School facility until a new parish house was built in 1952. At the congregational meeting of July 21, 1901, action was taken to build a parsonage. It was later enlarged during the pastorate of the Rev. L.D. Billnitzer and renovated a number of times after. Two adjacent lots were bought from Mr. H.C. Schulz at the price of $40 per lot. These lots, in addition to the lot purchased for the church structure in 1890, made up the property until 1967. During the Rev. Schmidt’s pastorate, membership increased by at least 20 members. During the spring of 1902, a storm damaged the church, but repairs were made. Mr. H.D. Meyer was hired as a part-time parochial school teacher and organist. In the first year of the school’s existence, 16 children were enrolled. 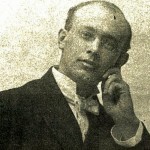 In 1903, Pastor Schmidt accepted a call to Des Moines, Iowa. A call was extended to the Rev. 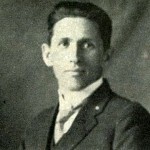 W. C. Lembke of Bulverde, TX, who became pastor of St. John on October 12, 1903. Pastor Lembke served for eight years as pastor and church school teacher until his strength failed. The Rev. F. J. Theimer became the next pastor. On May 24, 1912, after serving about 10 months, he re­ signed due to failing health. He returned to Fredericksburg, TX, where he soon departed from this life. On June 2, 1912, the Rev. Thomas Petersen came to serve as pastor of this congregation. It was dur­ing his pastorate that St. John became formally affiliated with the Ohio Synod, prior to the formation of the American Lutheran Church in 1930. Also, during his tenure of service, the first English Sunday School began in the congregation. This was due largely to the antag­onism against the German language during the First World War. 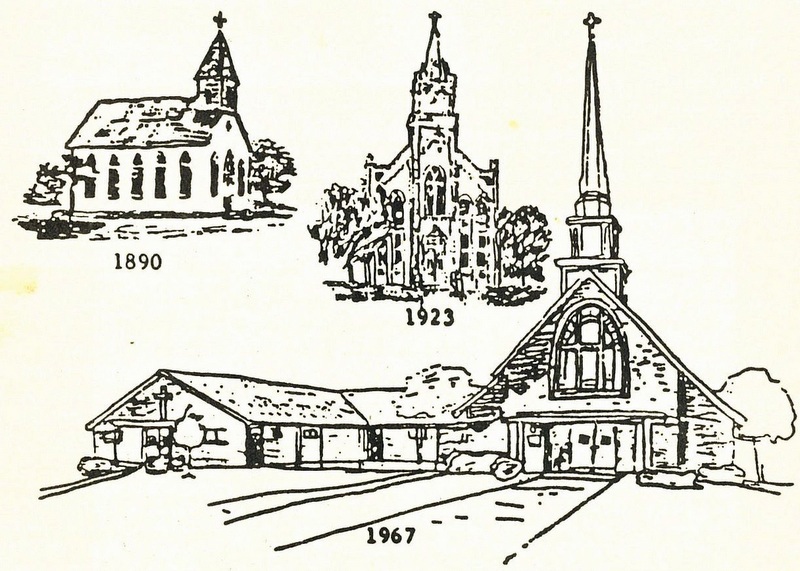 A history of the congregation's first 25 years, according to Pastor Petersen, relates that many weary and dark hours were spent by the pastors of this congregation. Hard work, struggle, and strife kept the congregation going. The pastorate of the Rev. Henry Brunotte marked a significant development in this congregation, as the second church structure (sometimes referred to now as "the brick church") was built during his stay. Pastor Brunette served St. John from July 1, 1920, to October 31, 1926. A building committee for the new church, consisting of Henry Rahe, Sr., C. Ruedrich, and F. Klein, was appointed in 1921. On July 8, 1923, the new church building was dedicated. On June 7, 1927, the Rev. 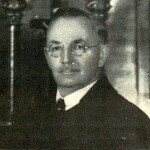 Albert Ernst Flathmann, Sr., became pastor of St. John after serving the Floresville Poth Deweesville parish. In 1931, he accepted a call to Ganado, Texas, having terminated his ministry on September 27, 1931. The Rev. Albert Ernest Flathmann, Jr., now of Eagle Pass, Texas, was baptized at St. John and later served as a missionary in New Guinea. The Rev. 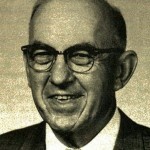 Henry K. Flathmann, subsequently pastor of First Lutheran Church in Shreveport, Louisiana, also spent a part of his boyhood days in Marion; he is now retired, and living in Seguin, Texas. The Rev. Henry W. Hafermann became pastor of St. John after the resignation of the Rev. A. Flathmann. Her served from December 10, 1931, until June 16, 1937 having accepted a call to the Salem Congregation, Onion Creek, near Austin, TX. After serving in the ministry for some years longer, he resigned in 1944 due to illness. 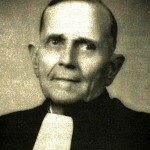 In 1937, the Rev. L. D. Billnitzer was called to serve at St. John. During his pastorate, a pipe organ was installed. Serving on the organ committee at that time were Mrs. Rose Rahe and Mr. Adolph Staats. It was also during Pastor Billnitzer's stay here that Mrs. Billnitzer passed away in 1948. The beautiful cross currently on the church altar wasgiven in her memory. 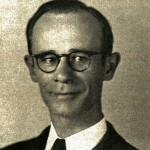 Pastor Billnitzer served St. John until February 1949, at which time he began to serve a parish in Clifton, Texas. He parted from this life on January 5, 1952. Both Pastor and Mrs. Billnitzer are buried in the Marion cemetery. The Rev. Harold Billnitzer, a son, spent his boyhood days in Marion. Texas Lutheran College, serving as the morning speaker, and the Rev. E.G. Knaak of LaVernia as the afternoon speaker. The bulding committee consisted of: Hemnut Dreyer, Rudolph Jandt, Walter Rahe, Oscar Reinhard, Edwin Theilengerdes, and H.J. Wetz. The finance committee consisted of: Fritz Rusch, Jr.- Chairman, Al Schultze- Secretary, WilliamBrietzke, Karl Dornbusch, Udo Grobe, George Hild, Oscar Matheaus, Elmo Rahe, Harry Scheffel, Udo Schmoekel, Nelson Schneider Harry Schuster Alf red Wahl George Wohlfahrt, Reno Wohlfahrt, and Monroe Zuehl. Upon terminating his ministry in Marion on January 1, 1956, Pastor Fruehling accepted a call to the Lutheran Welfare Society in Austin, TX. He is now Director of the Martin Luther Home in Beatrice, Nebraska. The congregation then extended a call to the Rev. H.
Zimmerman of Orange Grove, TX. He was installed on August 29, 1954 as pastor of this congregation. 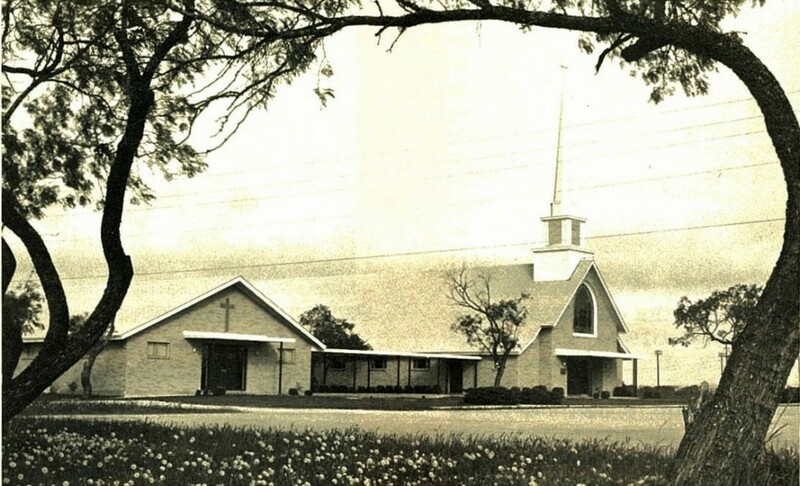 On July 18, 1963 he left Marion to establish Faith Lutheran Church as a missing congregation in Weimar, TX. He is now retired and lives in Roscoe, TX. At its annual meeting on January 13, 1957, the congregation decided that the German services being conducted once monthly be discontinued. Minutes of the congregation have been recorded in English since July 9, 1939. Before this time, all records were recorded in German. The Rev. 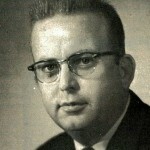 Arthur H. Sander, Jr., was installed on August 4, 1963, as pastor of the congregation by the Rev. H. A. Heineke of Seguin, Texas. The Rev. 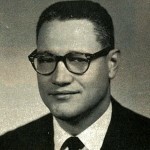 Sander accepted the call to serve at St. John shortly before his graduation from the Evangelical Lutheran Theological Seminary in Columbus, Ohio, on June 2, 1963. He was ordained by the Rev. P. Gogolin at St. John's Lutheran Church of Prairie Hill near Brenham, TX, on June 30, 1963. 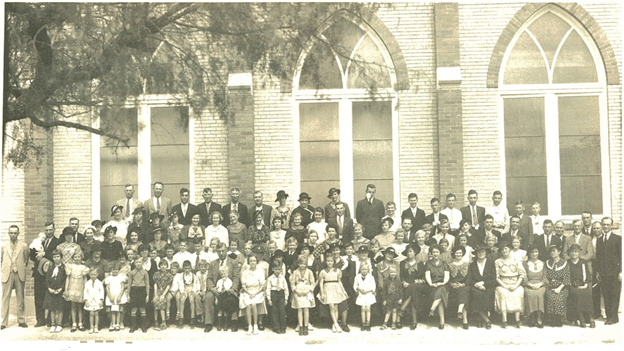 During his pastorate in Marion, the congregation celebrated their Diamond Jubilee. The special thank offering received on the day of the 75th anniversary observance was set aside for the building of a new church. Around the preparation time of this celebration, Mr. and Mrs. Walter Zuehl donated the five-acre tract of land just out­ side the Marion city limit on south FM 465 that serves as the present church site. Through the hard work and commitment of Pastor Sander and the congregation, the church and congregational building complex was planned and completed at a cost of about $110,000. The church and complex were dedicated on November 19, 1967. Some of the furnishings kept from the "brick" church are the pews, the lectern, and two stained-glass windows (the Shepherd Jesus at the rear of the upper level choir loft, and the Agnus Dei on the left side of the nave). In 1968, plans were drawn for the current parsonage. Pastor Sander accepted a call to Shreveport, Louisiana, during the summer. The Rev. 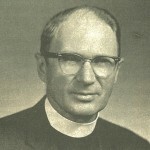 Wilbert E. Doerr was installed at St. John on August 18, 1968, in a service conducted by the Rev. 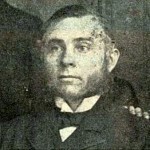 O. K. Oelke of Elm Creek. During the first year of Pastor Doerr's ministry, the construction on the new parsonage was completed, and the parsonage was dedicated. Pastor Doerr helped organize the first Girl Scout troop that met at St. John. Upon completion of his ministry at St. John, Pastor Doerr accepted a call to serve Immanuel Lutheran Church at Comfort, Texas, beginning in July 1978. He now lives in retirement in Seguin, Texas. 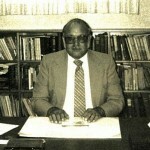 In 1989, he began serving a three year term on the Alumni Association Board of Directors of Texas Lutheran College. Pastor Doerr's son Nathan became the first pastor's son and son of St. John's to go into the ministry while the pastor served at St. John. Nathan received his B.A. degree at Texas Lutheran College on May 23, 1976. He went on to receive his theological education at Wartburg Theological Seminary in Dubuque, Iowa, receiving his Master of Divinity degree on May 18, 1980. Nathan was ordained at St. John on June 29, 1980. He is currently pastor at Ascension Lutheran Church in Colorado Springs, Colorado. The Rev. 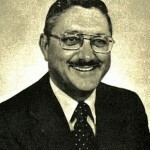 Michael Robinson was installed as pastor of St. John on October 22, 1978. During this time, the church saw a need to serve the community with an outreach ser­vice; and formed the St. John Day Care Center, which began operating with Irene Clements as director. 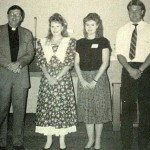 In September 1981, Pastor Robin­ son accepted a call to serve Atonement Lutheran Church in San Antonio. He now serves Grace Lutheran in Conroe, Texas. The Rev. James E. Witschorke was installed on January 11, 1982, having come from Brenham, Texas. and has become an annual event. August 23, 1988, was a joyous occasion for the congregation. During the regular church service, the note was burned for the Church and congregational building complex. The congregation gave thanks to God for the blessing of attaining this goal. During the latter months of 1988, work began on an addition to the activity center. Upon completion, the Day Care Center was moved into the activity center complex. On January 29, 1989, the activity center addition was dedicated in memory of Mrs. Lillian Seay whose memorial funded much of the project. On May 19, 1991, a new pipe fence on the east side of the cemetery was dedicated, with the north and west side fencing completed in June. Pastor Jim implemented the Crossways Bible Study; a 2-year comprehensive study of the Bible in 1993. In the same year, the building committee, comprised of Joh Dikes, Charles Bode, Glenn Kutz, Marjorie Lozano, Calvin Steffen, David Mueller, and Gerald Kriewald, recommended building an activity center and paving the church parking lot. In May, the church contracted to build a 40'x70' fully insulated metal building which included kitchen facilities and restrooms. The activity center was dedicated on October 31, 1993. A note burning ceremony was held on August 6, 1998 as the activity center was paid off in full. The parking lot was also paved in 1993 at an expense of $32,000, and an additional $10,500 was spent on air conditioning. In 1996, St. John honored Pastor Jim on the 30th anniversary of his ordination. In August of 1997 a 1200 square foot addition to the day care was started by the Marbach Brothers. The addition was needed due to the State of Texas requirements decreasing the number of children each teacher could have in their room. A new digital organ was dedicated in May of 2001. Dr. Davide Heller, Organ Professor at Trinity University, Sheryl Witschorke, and Glenn Stroh Jr. presented an organ recital for the dedication. The congregation is grateful that, through the grace of God, it has thrived and is able to celebrate its centennial throughout the year of 1989. On September 1, 1989, the baptized membership of the congregation stood at 664 and the confirmed membership at 531.